A chilly Sunday in the neighborhood and I decided to go a bit festive with my ensemble. With Christmas fast approaching, I found a perfect top to get myself in the Christmas spirit. This hammock green peter pan collar blouse from J.Crew Factory is flowy and festive and perfect for work or grabbing a weekend drink with a friend, especially when paired with my Kate Spade Cedar Street Aster purse. 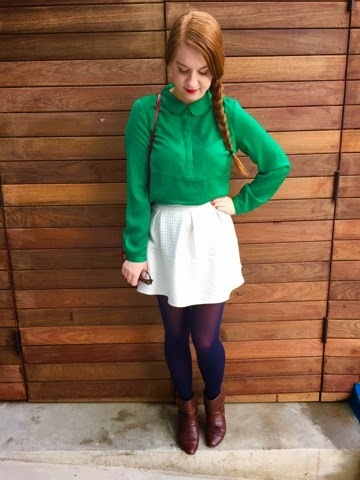 Pairing the top and purse with a white skirt, navy blue tights and some dark brown booties, it was the perfect outfit for an early morning brunch and on to a tour of some of San Francisco’s most festive Christmas trees. Such a cute and festive outfit! The color of that shirt looks great on you! I love the color of this shirt! It's so bold and fun. HOW CUTE! The color of that shirt was MEANT to go with your hair color! Very eclectic, love all the colors and textures. Love a good cross body bag! Maybe I should add a red one to my life like yours! This is the perfect Christmas outfit! I would probably wear it to a holiday party or to my family's Christmas festivities. It's so cute! Such a cute outfit! I love the pops of color (they're especially great with your hair!)! What a great outfit. Lovely shade of green. I love this! Winter white is my favorite! Those booties are perfection!!! I need to get myself a pair like that! That color is absolutely beautiful on you. Love the look. This all looks super cute. Such a subtle hint of Christmas colours, I love it! What a cute outfit! Love the colorblocking! I like that shade of green. It's nice and bright.